Justice Ruth Bader Ginsburg will be absent from oral arguments at the Supreme Court Monday. Ginsburg, 85, will miss oral arguments for the first time in her 25 years on the court, a spokesperson told reporters Monday morning. She will instead participate in the eventual vote on Monday's caseload relying on the transcripts which are produced as a matter of course. 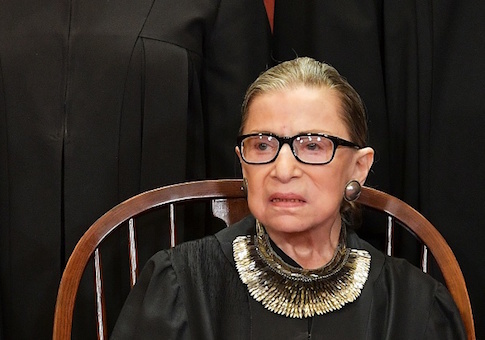 Instead of making her usual appearance, Ginsburg will be recuperating from surgery late last month to remove two cancerous nodules from her left lung. On Dec. 21, Ginsburg underwent a pulmonary lobectomy at Memorial Sloan Kettering Cancer Center in New York City. There was "no evidence of any remaining disease" following the operation, Court spokeswoman Kathy Arberg said at the time. This is not Ginsburg's first brush with ill health. In 2009, she underwent surgery for pancreatic cancer; earlier this year, she fell in her office, fracturing three ribs. Although Ginsburg is in recovery, her non-appearance is likely to provoke further discussion of her eventual departure from the Supreme Court. Such a move could grant President Donald Trump the option to shore up the court's new conservative majority, adding to the appointments of Justice Brett Kavanaugh and Neil Gorsuch. Alternately, in the event that a Democrat clinches the White House in 2020, Ginsburg's seat could be filled by a new, much younger liberal justice. Monday morning, meanwhile, the Supreme Court will go about its business one woman short. The remaining eight justices will hear arguments in Merck Sharp & Dohme Corp. v. Albrecht, a case concerning the pre-emption of state law by the FDA; and Obduskey v. McCarthy Holthus LLP, about federal laws governing debt collection. This entry was posted in Issues and tagged Ruth Bader Ginsburg, Supreme Court. Bookmark the permalink.